Did you buy the iPad Mini? Steve Jobs said "You‘ve got to start with the customer experience and work back toward the technology - not the other way around." However, I think Apple forgot what Jobs believed in by launching the iPad Mini. Apple now competes with their 7 inch tablet as well as the 10 inch tablet in the market place. This was a call from management to increase market share in the small tablet market; it was not a call to innovate on a new product. Nevertheless, I am not here to debate their strategy or innovative process, because I believe there are people that prefer a smaller iPad ... aka the iPad Mini. Design. The new iPad mini sits comfortably into your hand and it is effortless to pick it up. 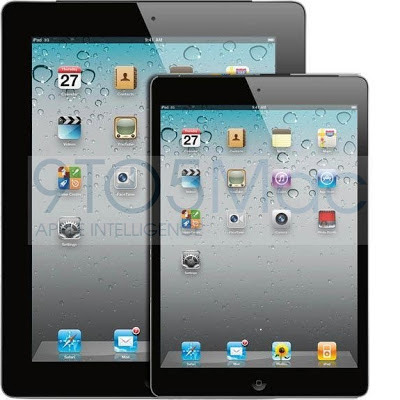 We can expect that the design of the iPad mini will follow suit and look as nice as its' brothers - the iPad and iPhone. The shell is more curved but not quite as sharp as the iPhone 5. Usability. Apple fans can expect the same user friendly interface that they have become accustomed to. Applications will have to be reformatted to fit the iPad mini, but in time the ecosystem shall be strong! The smaller surface area gives the users a different experience. People that have an iPad will probably not rush out to get the mini, regardless, it is easy to use and take with you. Functionality. The iPad mini is highly functional when it comes to on-the-go activities! The light-weight design and architecture of the iPad mini will make the users enjoy the flexibility to carry your mobile device and the mini. Price. The iPad mini pricing is starting at $329.00 which may be a little more than people are willing to pay for a mini tablet. Although the price is higher than its competitors, Apple serves in the premium market, and provides quality products. In conclusion, if I enjoy the user experience of my iPad. If it was time for an upgrade, I would certainly consider the iPad Mini, but I would definitely buy a new iPad. The bigger screen for me is more enjoyable and a pleasure to watch TV shows and movies while I am on the plane, train, or a long car ride. Thanks for reading my post, and if you agree or disagree with my thoughts, please feel free to comment. Thanks.